Jeep’s Twitter got hacked today. Like the Burger King hacking yesterday, the hackers included some McDonald’s images. The avatar photo was changed to the Cadillac symbol (which has since been taken down). One of the tweets read: “We just got sold to @Cadillac because we caught our employees doing this in the bathroom” and showed a man with a prescription pill bottle. Another says “Sorry guys, no more Jeep production because we caught our CEO doing this,” and shows a man who appears to be smoking a joint. 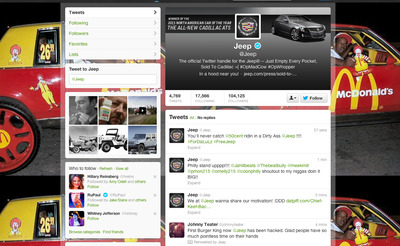 The Burger King tweets featured the hashtag “#OPMadCow.” So far, it’s unclear why Jeep was targeted.